The world's most famous radio telescope will become the "Karl G. Jansky Very Large Array" to honor the founder of radio astronomy, the study of the Universe via radio waves naturally emitted by objects in space. The National Radio Astronomy Observatory (NRAO) announced the new name for the National Science Foundation's Very Large Array (VLA) at the American Astronomical Society's meeting in Austin, Texas. The new name will become official at a rededication ceremony at the VLA site in New Mexico on March 31. After more than a decade of work, the VLA, originally dedicated in 1980, is nearing completion of a technological transformation that has turned it into a completely new and vastly more capable radio telescope. The new name recognizes the VLA's dramatic new capabilities and its promise for important scientific discoveries in the future. "When Karl Jansky discovered radio waves coming from the center of the Milky Way Galaxy in 1932, he blazed a scientific trail that fundamentally changed our perception of the Universe. Now, the upgraded VLA will continue that tradition by equipping scientists to address outstanding questions confronting 21st-Century astronomy," said NRAO Director Fred K.Y. Lo. 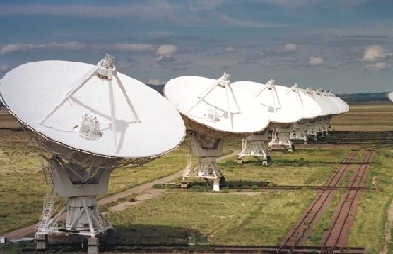 "It is particularly appropriate that the upgraded Very Large Array honor the memory and accomplishments of Karl Jansky," Lo explained, adding that "the new Jansky VLA is by far the most sensitive such radio telescope in the world, as was the receiver and antenna combination that Jansky himself painstakingly developed 80 years ago." The new name was selected from among 23,331 suggestions submitted by 17,023 people from more than 65 countries. The NRAO asked the public and the astronomical community to suggest names that reflected both the proud heritage and the future promise of the telescope. Many names, including that honoring Jansky, were submitted by more than one person. The number of unique names submitted was 16,223. The observatory accepted suggestions at a web site open from mid-October to December 1, 2011. "We deeply appreciate the strong public interest in the VLA and in astronomy that is represented by the many people who submitted suggestions," Lo said. "There was a tremendous amount of thought and creativity that went into the numerous submissions," he added. "In the end, we decided it was most appropriate to name the telescope after a genuine pioneer who took the first step on the road that led to this powerful scientific facility," he said. Karl Guthe Jansky joined Bell Telephone Laboratories in New Jersey in 1928, immediately after receiving his undergraduate degree in physics. 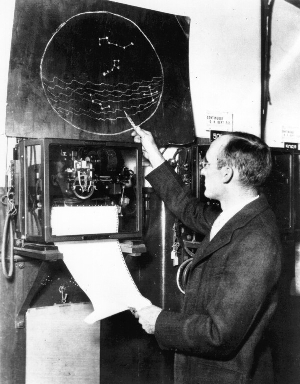 He was assigned the task of studying radio waves that interfered with the recently-opened transatlantic radiotelephone service. After designing and building advanced, specialized equipment, he made observations over the entire year of 1932 that allowed him to identify thunderstorms as major sources of radio interference, along with a much weaker, unidentified radio source. Careful study of this "strange hiss-type static" led to the conclusion that the radio waves originated from beyond our Solar System, and indeed came from the center of our Milky Way Galaxy. His discovery was reported on the front page of the New York Times on May 5, 1933, and published in professional journals. Janksy thus opened an entirely new "window" on the Universe. Astronomers previously had been confined to observing those wavelengths of light that our eyes can see. "This discovery was like suddenly being able to see green light for the first time when we could only see blue before," said Lo. Through the new "window" that Jansky opened, astronomers study radio emission from objects throughout the Universe. Discoveries made with radio telescopes have earned four Nobel Prizes. Those include the discovery of pulsars, the ubiquitous microwave background radiation that is the remnant heat from the Big Bang, and the first indirect evidence for the gravitational waves predicted by Albert Einstein. Jansky, who died at the relatively young age of 44, before radio astronomy produced its major contributions, never was so honored for his discovery, but a Nobel Prize was awarded in 2002 for comparable discoveries of cosmic radiation in other regions of the spectrum. Jansky has been memorialized by the scientific unit "Jansky" that astronomers use every day as a measure of the strength of astronomical radio sources. The original VLA was authorized by Congress in 1972, and astronomers began using it for research even before its dedication in 1980. To date, more than 2,500 scientists from around the world have used the VLA for more than 13,000 observing projects studying phenomena ranging from our own Solar System to the edge of the observable Universe, billions of light-years away. More than 200 Ph.D dissertations have been based on data obtained from VLA observations. Upgrading the electronics of the VLA to the technological state of the art began in 2001, and completion is scheduled for later this year. The upgrade project was funded by the National Science Foundation, and by contributions from Canada and Mexico. The upgrade replaced the 1970s-vintage electronic equipment, analog data-transmission system, and the central, special-purpose computing "heart" of the system with state-of-the-art receivers and electronics, an all-digital, high-bandwidth fiber-optic data-transmission system, and a new, central supercomputer with an innovative design, built by NRAO's Canadian colleagues. When the upgrade project started, the VLA was called the Expanded VLA, or EVLA. The Jansky VLA is more than ten times more sensitive to faint radio emission than the original VLA, and covers more than three times more radio frequency range. It will provide astronomers the capability to address key outstanding scientific questions, ranging from the formation of stars and planets in the Milky Way and nearby galaxies, to mapping magnetic fields in galaxies and clusters, and imaging the gas that forms the earliest galaxies.